The main objective was to make a protective cover to prevent our cats from playing with the threads of the overlocker. Each time our cats play with the threads and breaks or tangles them, my wife then has to rethread the overlocker; which is fiddley and time-consuming. The other objectives I set myself was to use recycled wood to keep the cost down, make it more than just a simple box so that it would be aesthetic, and make it multi-functional. 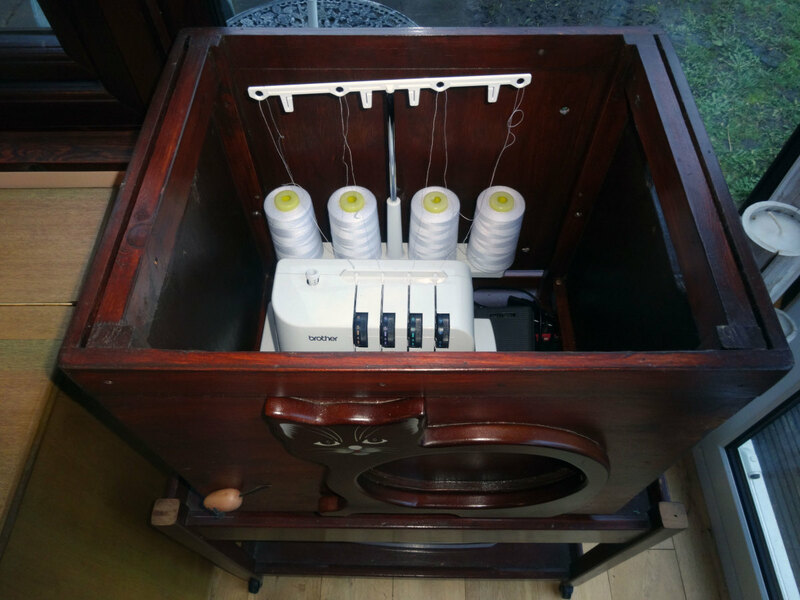 An overlocker (or serger) is a specialised sewing machine that uses four threads to produce a stitch that sews over the edge of one or two pieces of material for edging, hemming and seaming. The two main constraints were size and weight. My wife keeps her overlocker on a tea-trolley, which is just a couple of inches wider than the overlocker itself. So the first constraint was that the inside measurement of any protective cover couldn’t be much smaller than the width of the trolley top, so as to give adequate clearance when placing the cover on top or lifting it off. The second constraint was that it couldn’t be too heavy for my wife to lift when removing or replacing it over the overlocker. The folding tables and wooden drawers was pine wood and the fruit bowl was MDF. We were originally given the folding tables from a friend, who no longer needed them, and for a while used them as sofa tables for our evening meal when watching TV. Then I replaced them with two bespoke tables, one I made by upcycling an old solid oak valet stand that we’d been given. 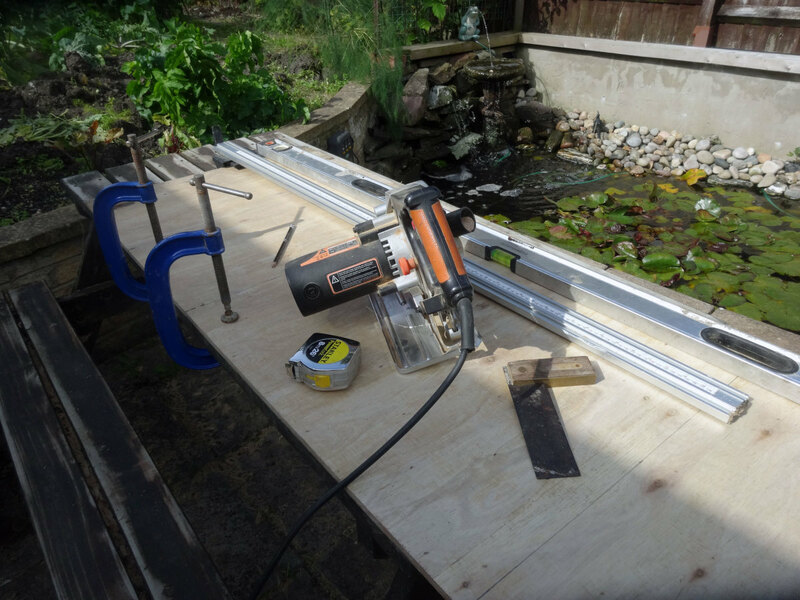 I then added the folding tables to my wood store in my workshop for future recycling. The solid pine wooden drawer came from an old wardrobe that a friend gave us for scrap wood because he no longer needed it. The 12mm plywood I used in this project was originally the door to my garden tool shed, but became surplus when I replaced it with our old front porch door that I salvaged when we had our house re-doubled glazed with new uPVC windows and composite doors. The 9mm plywood was from a piece of surplus homemade furniture a friend gave me for use as scrap wood, and the 4mm plywood was offcuts from previous DIY project. 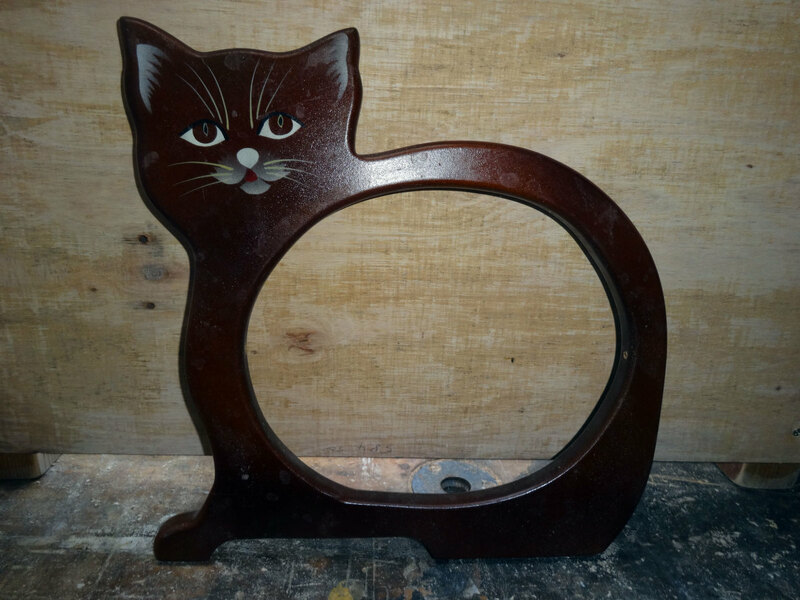 The cat motif was from an MDF fruit bowl that had broken, and which my wife was going to throw out; but which I salvaged for future use. The wooden mouse was from an old cheeseboard. 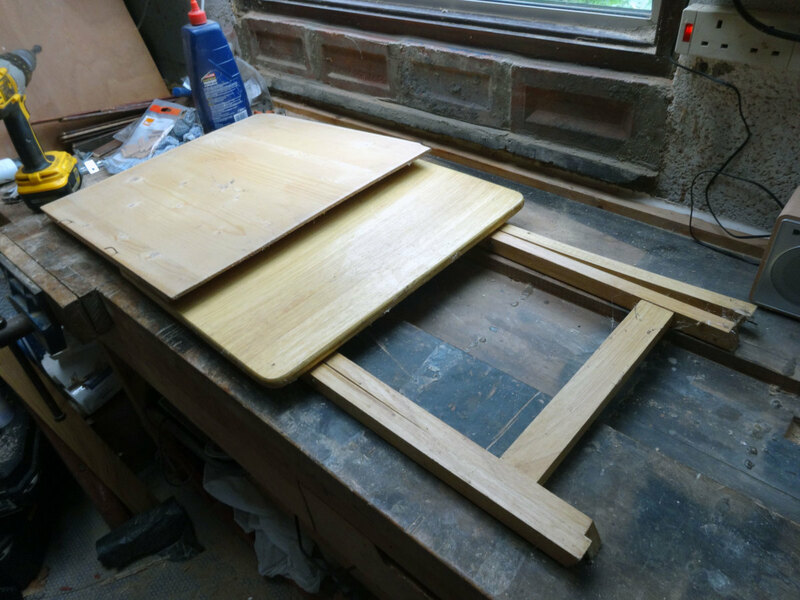 Folding table to be upcycled, and 9mm plywood salvaged from another DIY project. Both folding tables ready for dismantling; table top already removed from one table. 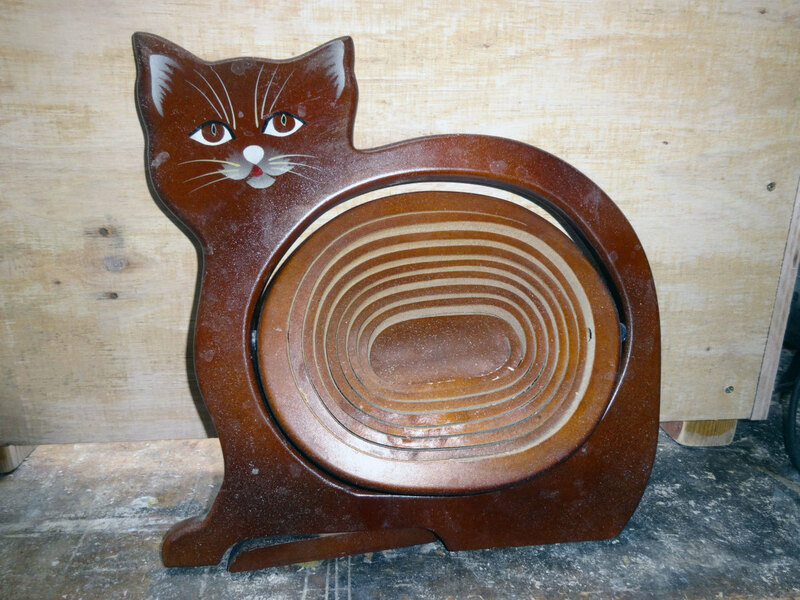 Old broken MDF cat motif fruit bowl. An old garden shed door ready for belt sanding in preparation of recycle the plywood. 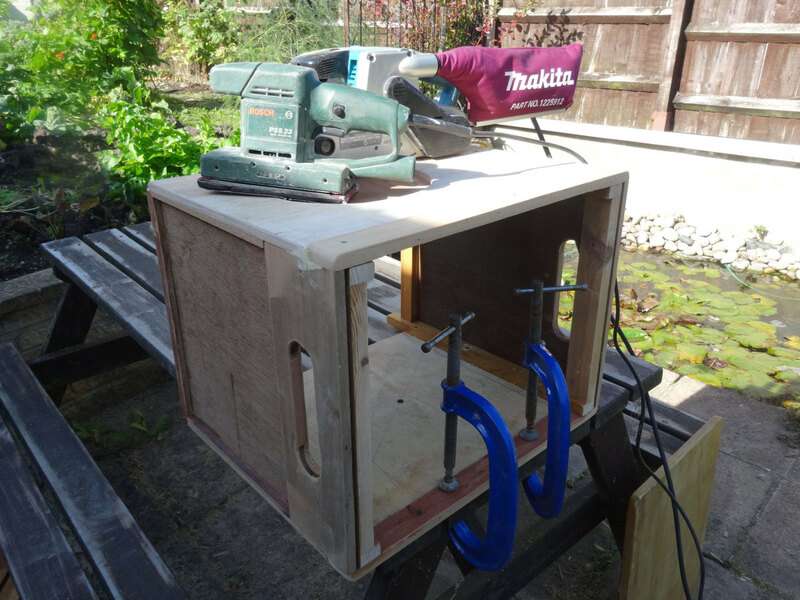 When making something for the home I like to make it multifunctional if possible, and in this project, I saw the opportunity to make the anti-cat overlocker cover to double up as a stool and or coffee table. 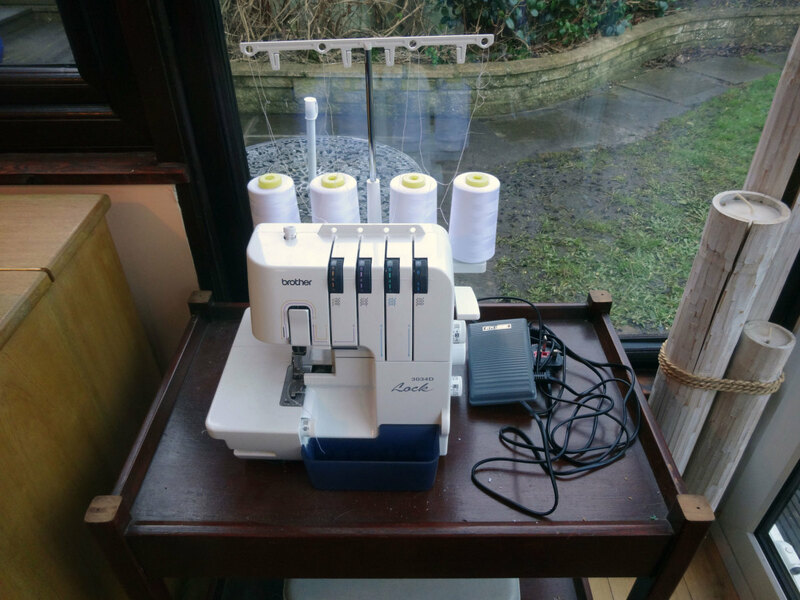 The concept being that if at any time we’re in the conservatory with guests (where the sewing machines are), and thus able to keep an eye on the overlocker, then we’ve got the option to use the protective cover as extra seating or a coffee table. Do you use multifunctional furniture in your home, such as step stools and sofa beds? 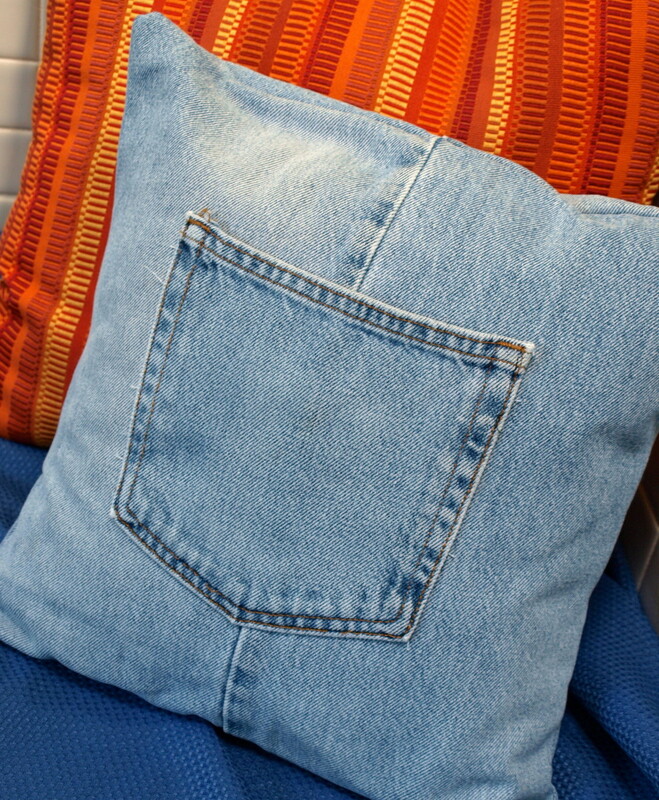 I find multi-purpose furniture a very useful space saver. I would find it useful but do not have any at the moment. I do not need any at the moment but I like the idea. I think such furniture is a waste of money. 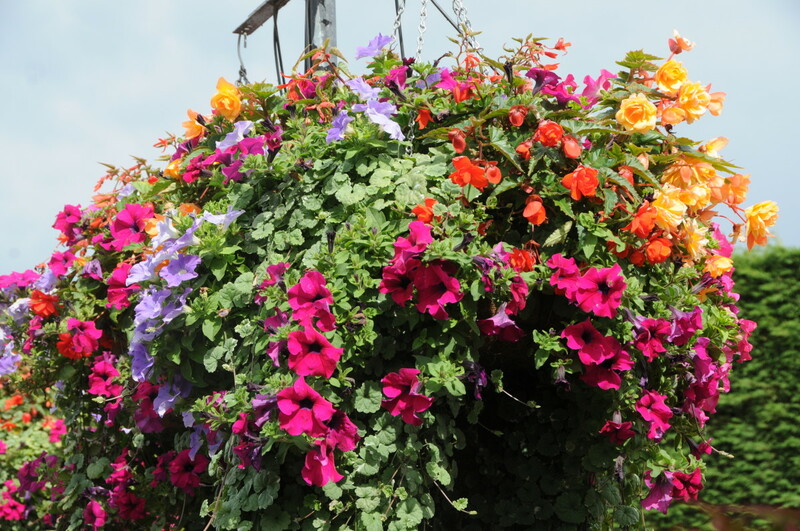 The last thing I wanted was just a wooden box; it would just look too naff. I wanted something with a little bit of character or style. 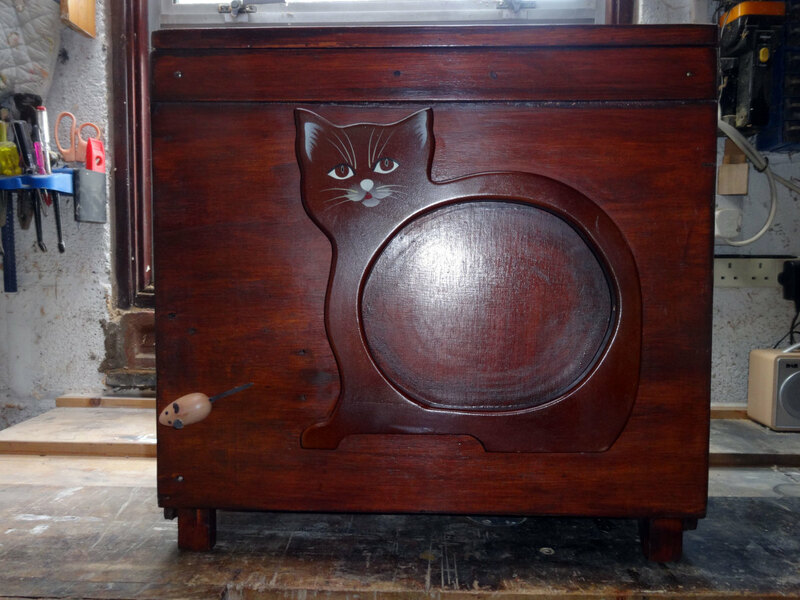 Hence my delight in the prospect of incorporating the cat motif from the fruit bowl and the wooden mouse; which I thought would be poetic justice in that the box is designed as an anti-cat protective cover for the overlocker. 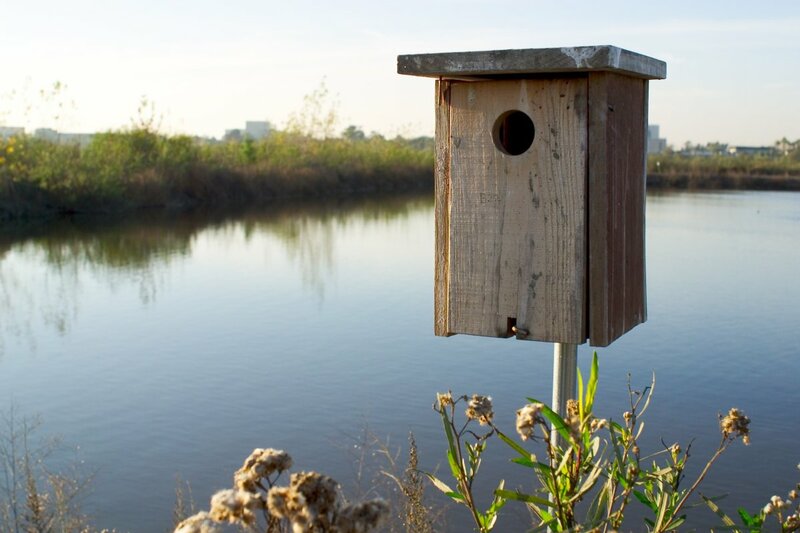 Another consideration for the aesthetics is that as the protective cover would be made from a mishmash of recycled scrap wood that a rustic look might be appropriate; especially as it is a finished look that we like in some furniture. If I piece of furniture is made from quality wood, usually a hardwood such as oak, teak or mahogany, then yes it should be finished to a high standard to show off the beauty of the wood. However, although you can achieve a good finish by wood staining cheaper (softwoods), such as pine and or plywood, it can sometimes look contentious (false); and we don’t like painting wood because it just hides the natural beauty of wood. Therefore, we sometimes find it more pleasing to see a rustic finish, as it’s a more honest statement; just as some people like to see the patina of old furniture. 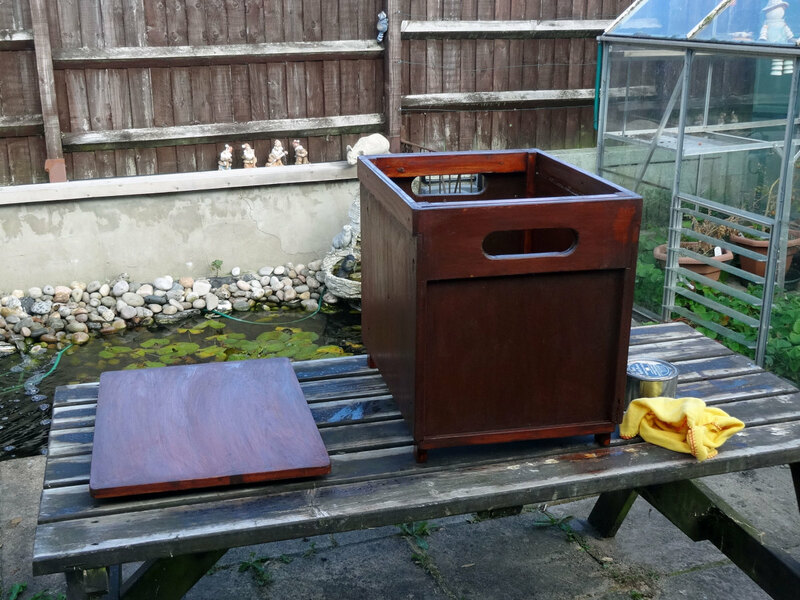 In accordance with the objectives and constraints, including the desire to make it from recycled wood, aesthetically pleasing and multi-functional, my first task was to take detailed measurements of the overlocker, and the tea-trolley it sits on so as be able to draw a sketch plan as a guide. Dismantling one of the old folding tables. Folding tables dismantled and ready for upcycling. Broken basket removed from the centre of the cat motif. 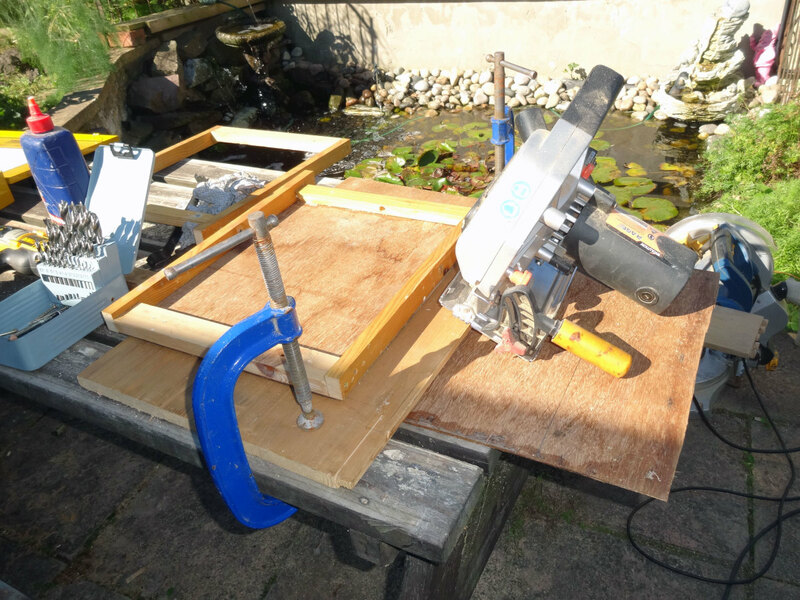 Measuring and cutting required plywood from an old garden shed door. For this project I used 12mm (half inch) plywood for the front panel, 9mm (about 3/8 inch) for the back panel, and 4mm (about 1/8 inch) for the two side panels. 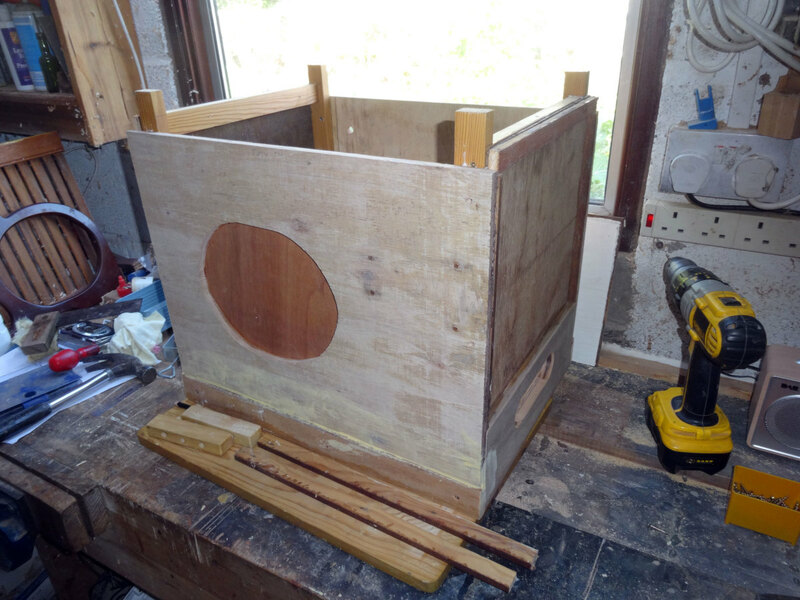 The intention of using thinner, rather than thicker, plywood where possible was to keep the overall weight of the box to a minimum (while not compromising on strength too much) to make it easier for my wife to be able to lift it over the overlocker when putting it in place or removing it. A more detailed description of each phase of construction is as follows. 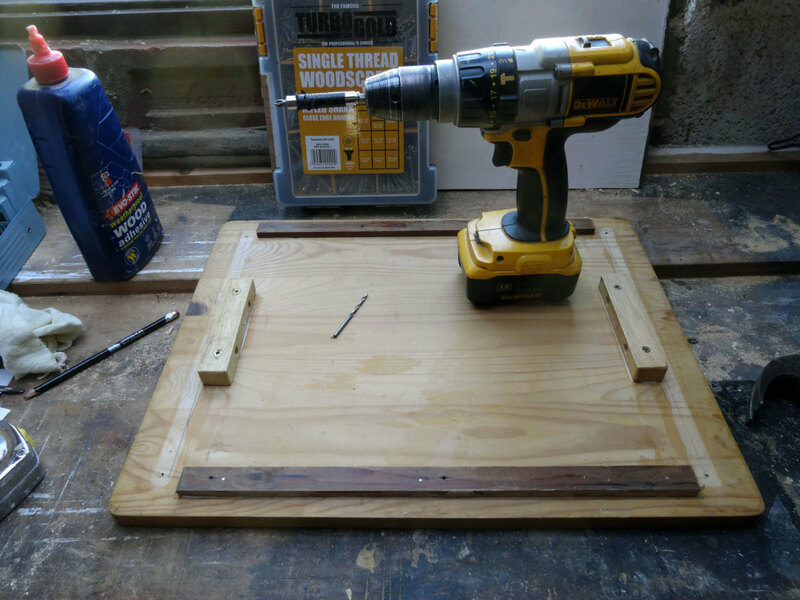 Glue and screw the frame together. Temporarily screw (or clamp) the bottom cross bar of the frame to a firm surface, to hold it flat and in place. Measure diagonally across from one corner to the opposite corner, repeat for the other two corners; then push the top half of the frame slightly in one direction or the other until both sets of measurements are identical. Make a final check, and if both sets of measurements are identical then the frame is square. 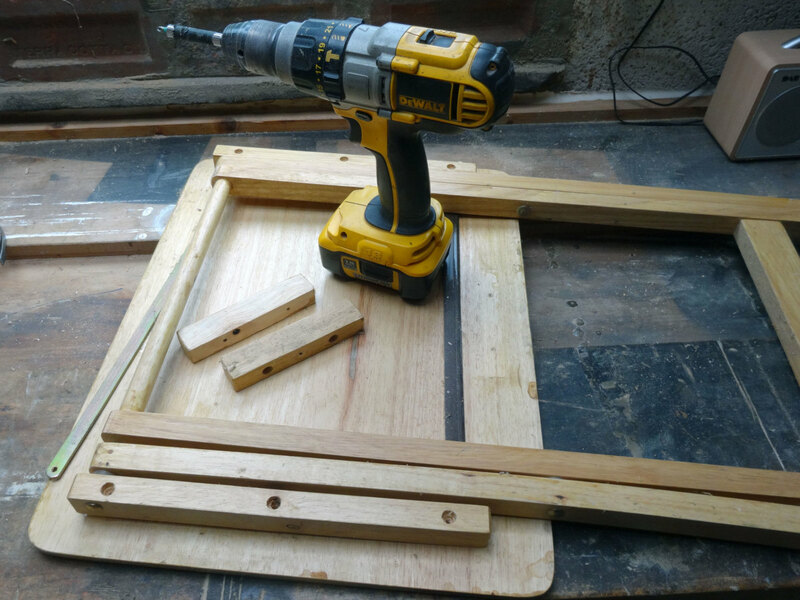 Once you’re satisfied the frame is square, clamp in place and leave overnight for the glue to set. Repeat steps 1 to 5 above to make the second side frame. 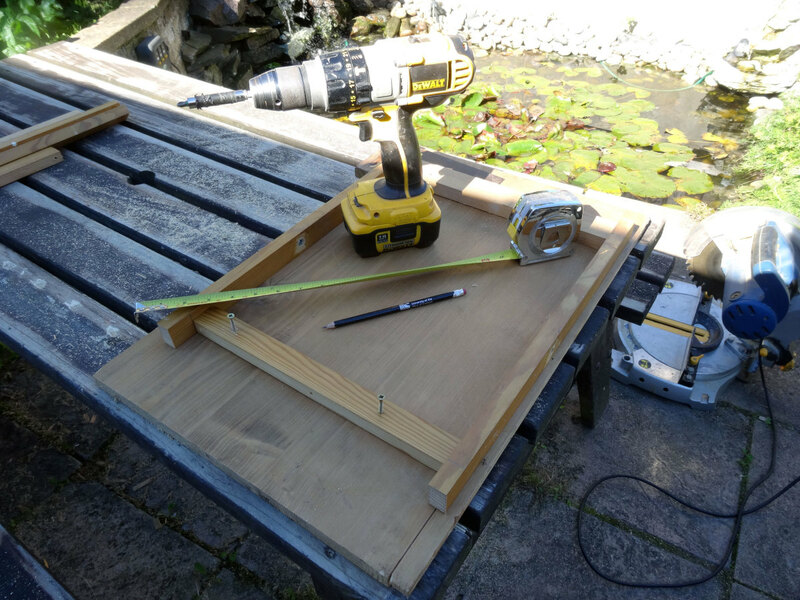 Having glued and screwed one of the side frames; temporarily fixing its base to a firm surface and measuring the corners diagonally to check the frame for squareness. Being satisfied the side frame is square, clamping it up while the glue dries. 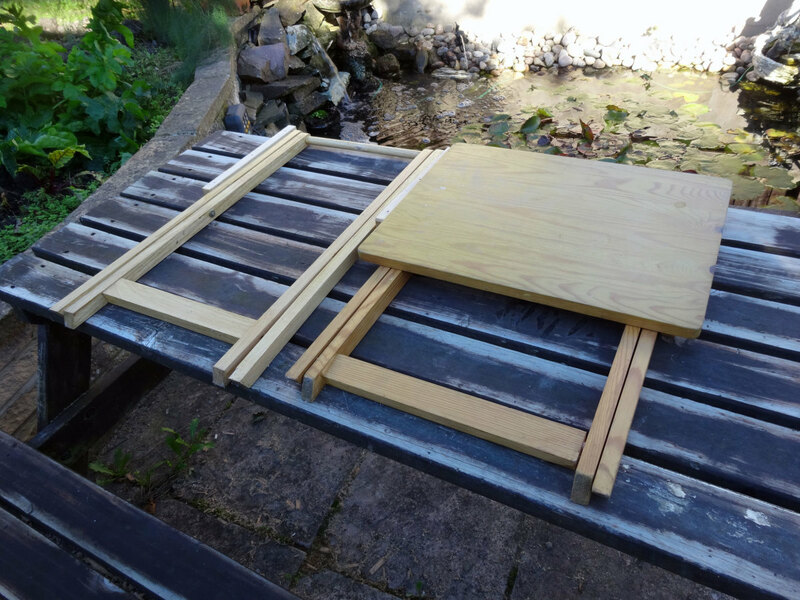 Once the side frames were made I then measured thin plywood to fit, and cut to size before fitting them in place with wood glue and invisible nails. 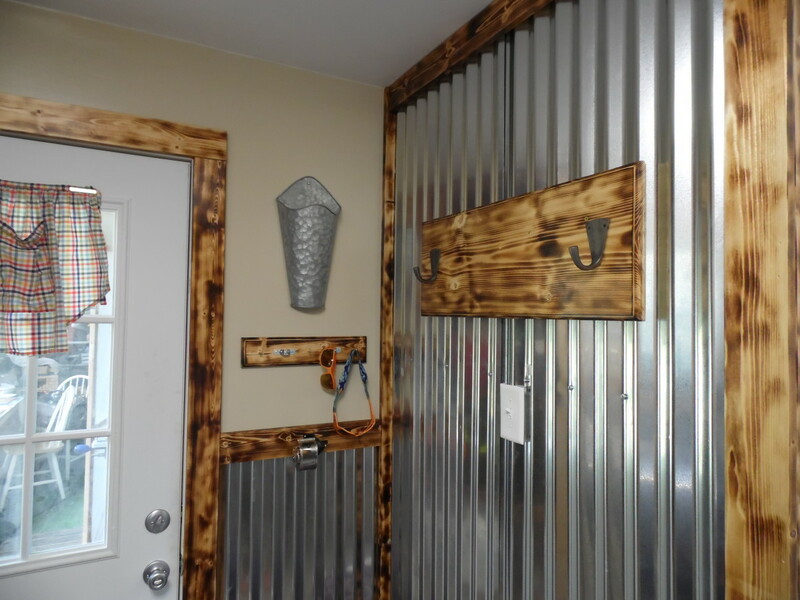 You could tack it in place with panel pins, but the staple gun I use also takes thin wire nails that are almost invisible once the wood is stained. 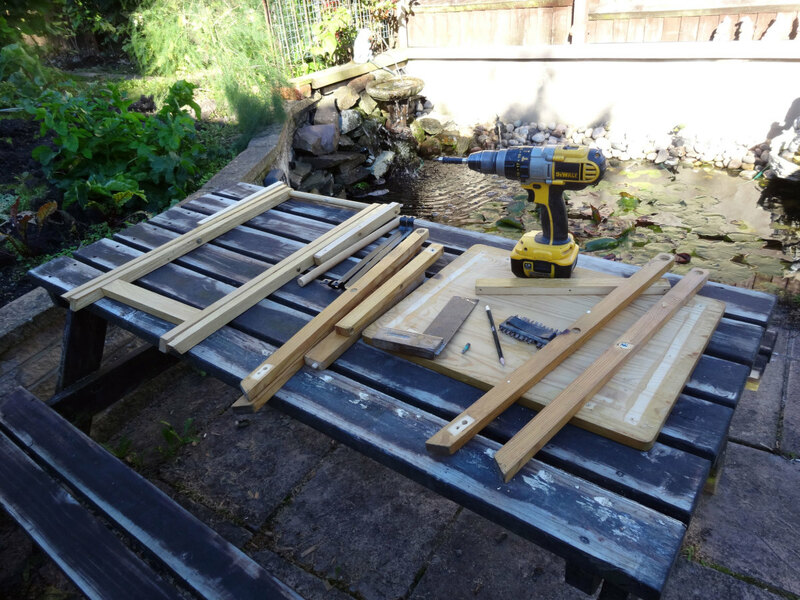 Alternatively, you could just glue the panels to the frames and hold firmly in place with clamps until the wood glue has set. Gluing and pinning the plywood in position over the side frames. Measuring and cutting the thin plywood to size. The purpose of the hand holds is to make it easier for my wife to lift the box when placing it over the overlocker or removing it. As the hand holds would be in the side panels, made from just 4mm plywood and therefore not strong enough, I also fitted wood from an old pine drawer along the top of the side panels (where the hand holds would go) for added strength and rigidity. Measure and mark where the hand holds will go on the side panels. 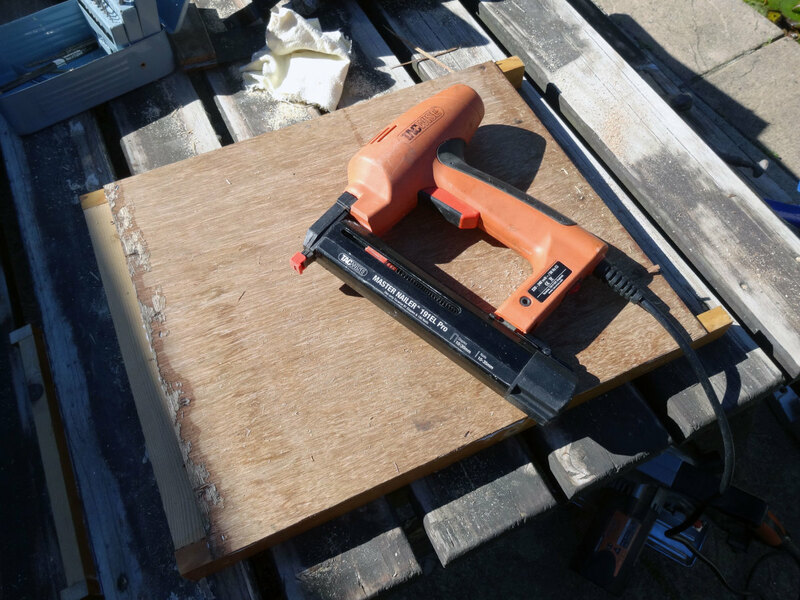 Use a saw hole cutter in your electric drill of a suitable size e.g. 2 inches in diameter, to cut a hole on both sides of where the hand hole will be. 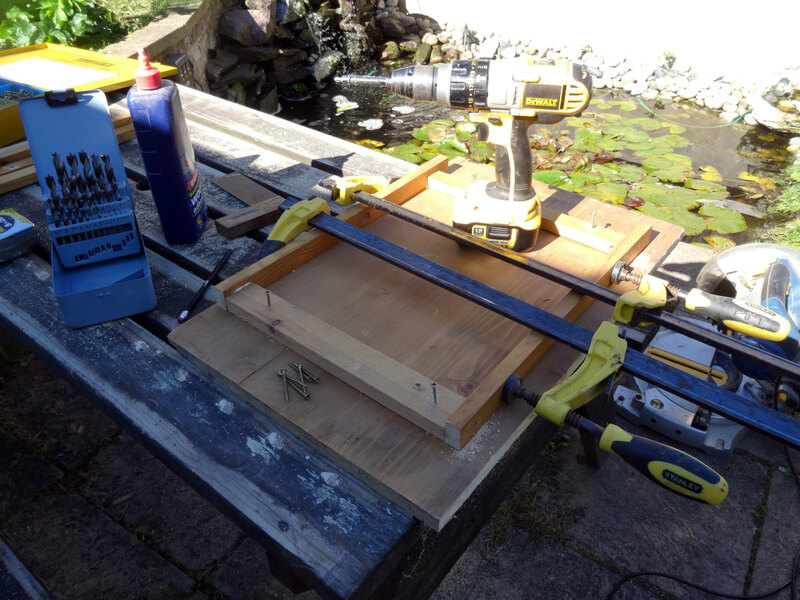 Use a jig saw to join the two holes by cutting between the holes, top and bottom. 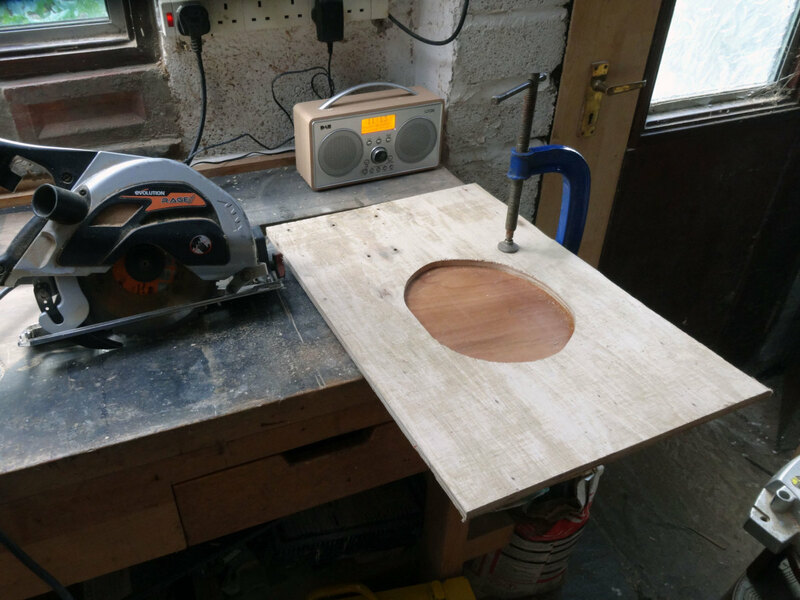 Then either round off and sand smooth the edges of the hand holes with a sander and sandpaper, or use a router for a suitable decorative finish to the edges. Using a jig saw to cut between the two end holes to make the hand holds in the side panels. Using a hole saw to cut the ends of the hand holds to the correct height and shape. While I was able to use thin plywood for the side panels (to keep the weight down) because they were fixed to a frame, the front and back panels needed to be thicker for rigidity; and the front panel needed to be thick enough to securely fit the cat motif. 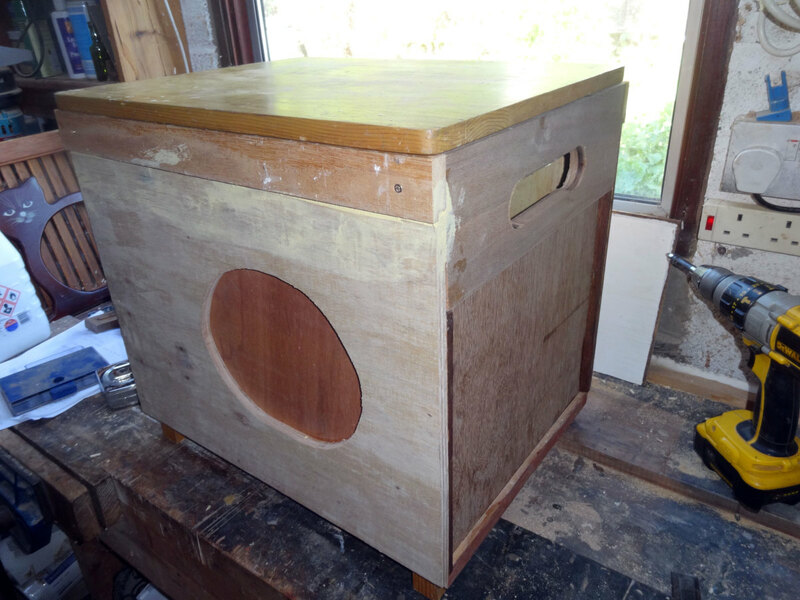 Therefore I used 9mm plywood for the back panel, and 12mm plywood of the front panel. For additional rigidity I also added a piece of timber to the top of the front and back panels. 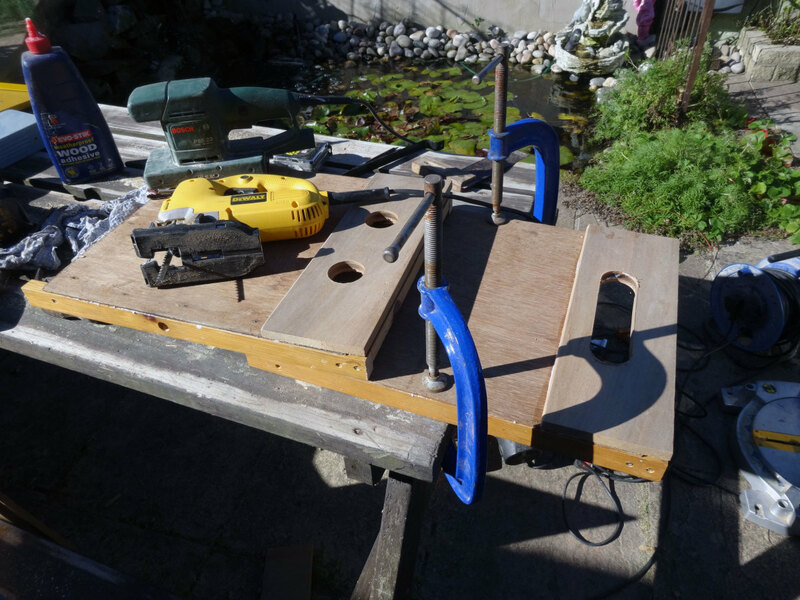 Once cut to size and sanded, and the support timber fixed to the top of the back panel, it was ready to glue and screw to the side panels. Measure, mark and cut the plywood to size. Use the cat motif as a template to mark an inner circle. 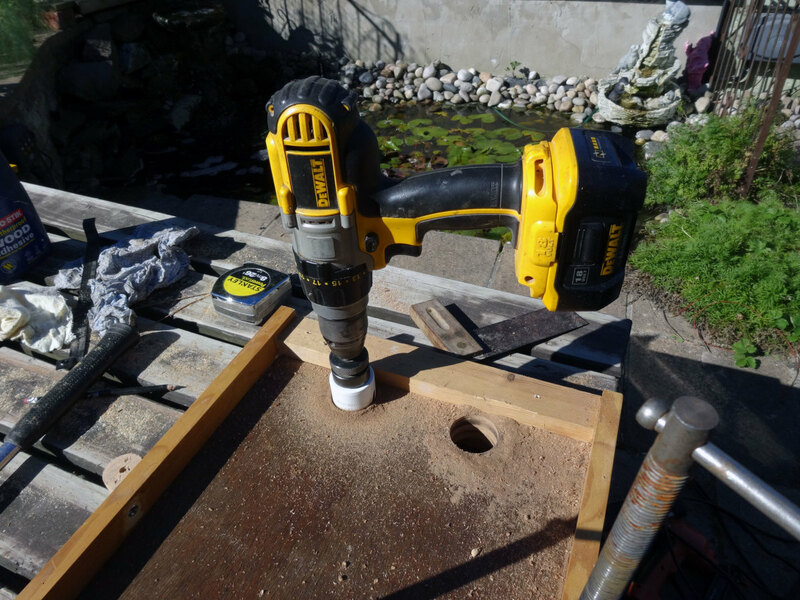 Drill a hole on the inside line of the circle to insert a jig saw blade, and then use the jig saw to cut out the circle. Cut and fit a piece of 3mm plywood to the back of the panel to cover the circle. Glue the support timber to the top of the front panel. Front panel made, with insert for cat motif, and ready for assembling. 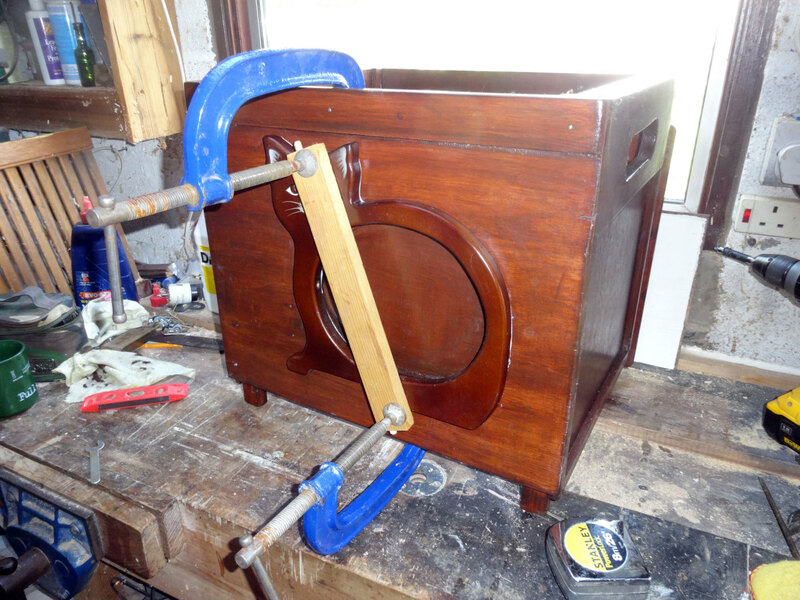 Add wooden decorative trim to the side panels. Assembling the sides panels to the back. Fitting the front panel in place. As coincidence had it, the top of one of the folding tables I used for the wood to make the leg frames for this box happened to be exactly to right size required. 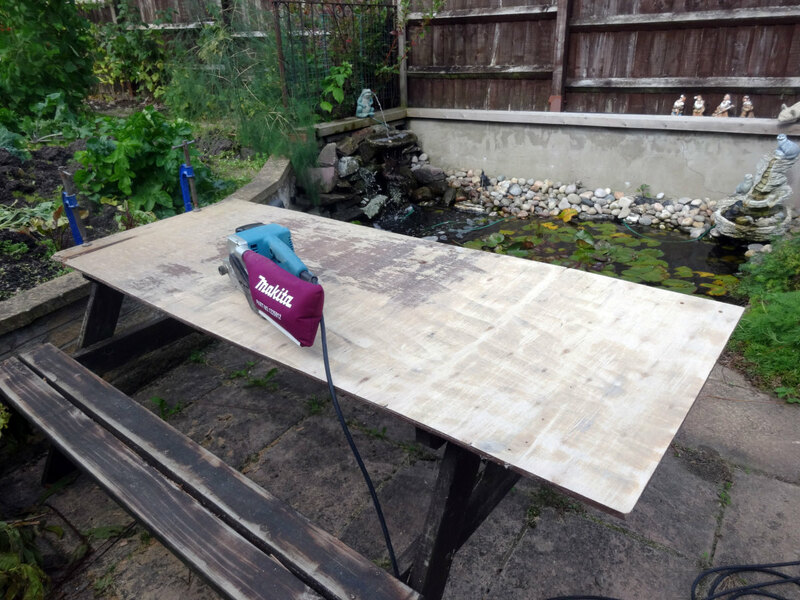 Therefore, all I needed to do was to secure pieces of scrap wood to the underside of the table top keep it in place when it’s placed over the top of the anti-cat overlocker box cover. If the table top had been too small then, as the box is intended to be multi-purpose e.g. double up as a stool and coffee table, I would have had to have found plywood (or other suitable wood) strong enough to take the weight of being sat on. One consideration would have been to make the top from oak or pine floorboards. Underside of removable top fitted with wooden blocks to keep it securely in place. Being made from scrap wood, fill in any unwanted imperfections with wood filler. 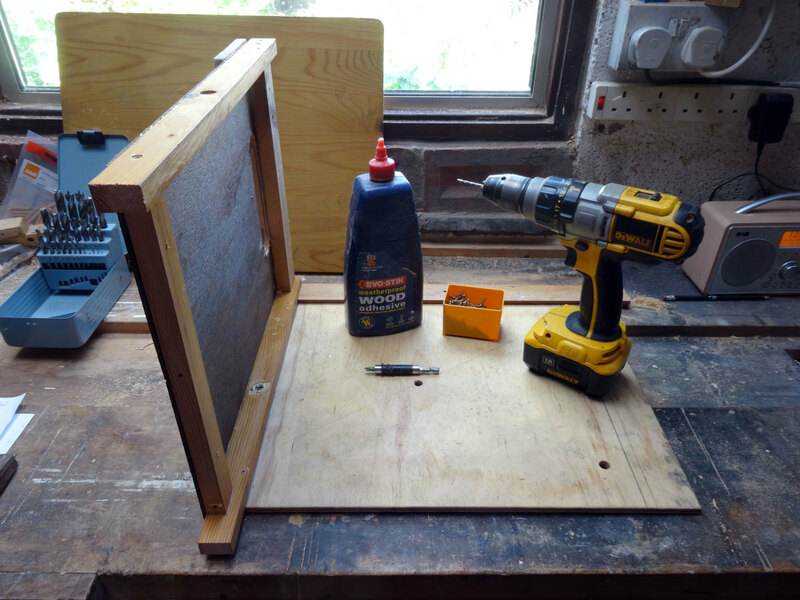 Once the wood filler is dry, give the whole box a good sanding. Wipe the whole box clean with white spirt on a cloth. One the white spirit is dry, apply two coats of wood stain; waiting for the wood stain to dry between coats. 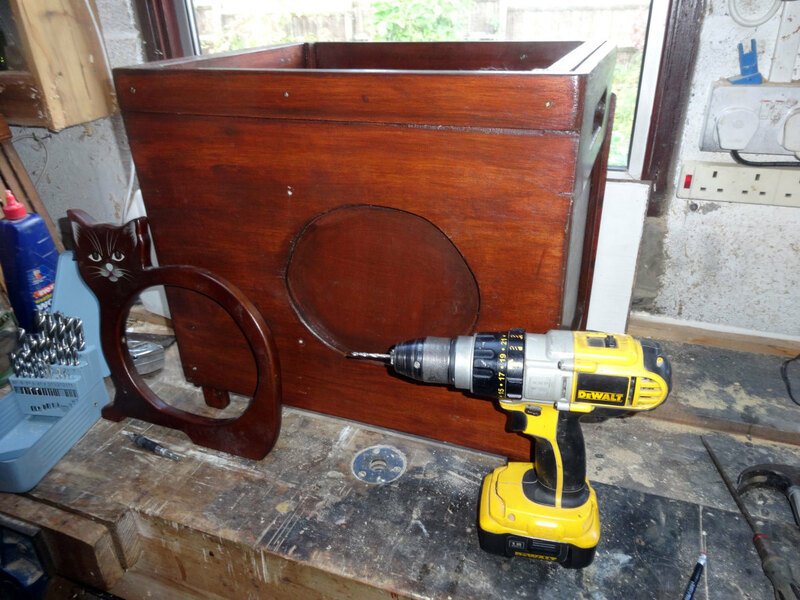 Give the box a light sanding by hand, and quickly wipe clean with white spirt before adding the third and final coat of wood stain. 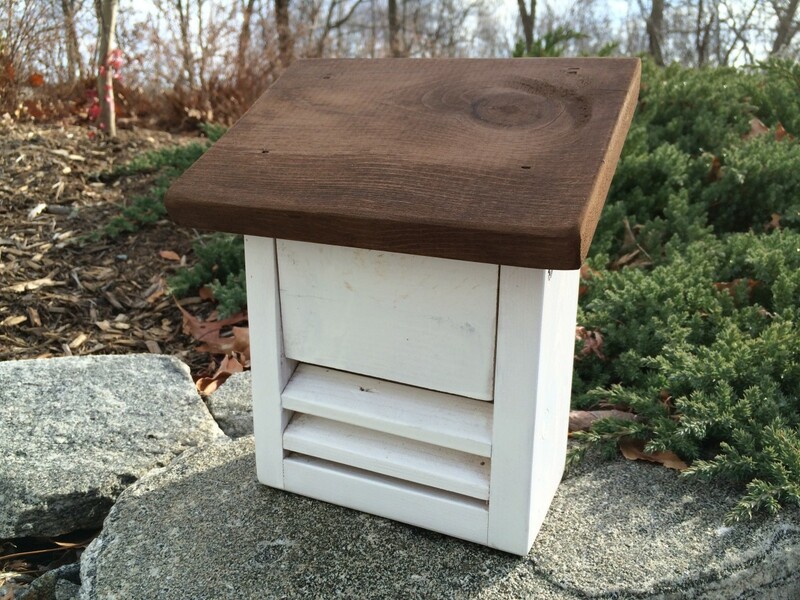 Once the wood stain is dry, give the box a good polish with beeswax polish, that does not contain silicon. Using wood filler to fill unwanted imperfections in the recycled wood. Final sanding of the box before wood staining. 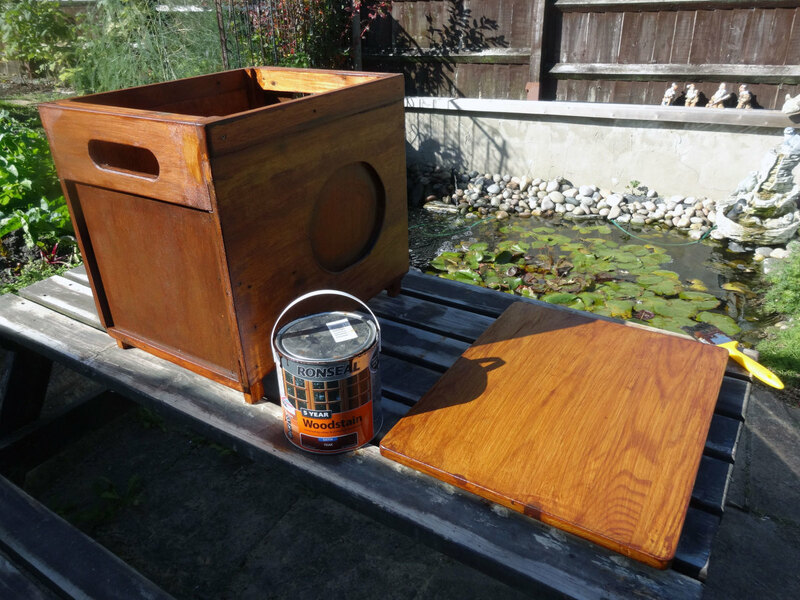 Wood Staining the box; with three coats. Giving the box a good polish with beeswax polish that doesn't contain silicon. Applying wood glue to the back of the motif. Screwing it in place from inside the box, so that there would be no visible screws. Ready to glue and screw the cat motif in place. Wooden cat motif clamped in place while the glue dries. 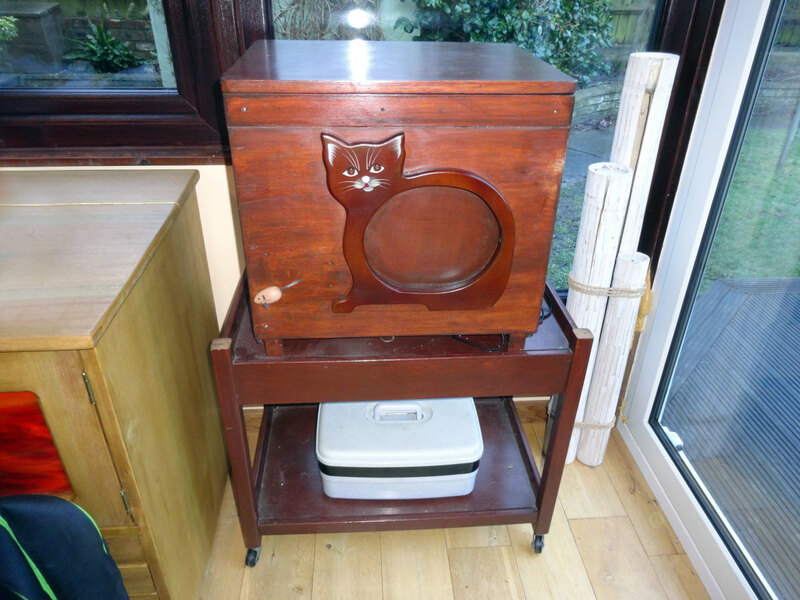 Wooden anti-cat overlocker protective box cover in use. View of overlocker inside, with lid of the protective box removed. Yep, I agree, there’s never enough time. I’m just as busy in retirement as I was when I was working full time. Which is the way I like it; I’d hate to be idle. I make lists and I prioritise, but the one thing I never have enough of is time. Yep, that was my experience to. Although at home I use my computer as a tool where it’s beneficial e.g. simple Task Lists in Excel for all those jobs around the home, so that I can Prioritise, Plan and Schedule for the year; to get all those DIY and Gardening jobs etc., done. The main advantage I find in keeping simple Tasks Lists to Prioritise, Plan and Schedule for the year ahead is that it does discipline me into ensuring DIY Projects get done on schedule, rather than forgetting about them or putting them off to another day as so many of my friends tend to do. I started just as computers were coming in. I think they cost us more time than they saved. Sometimes I think that's still the case for me now! Snap. My civil service training in Admin (old school), and Management Skills, throughout a long career has given me many skill sets that I find invaluable ‘Domestically’ and ‘Socially’. 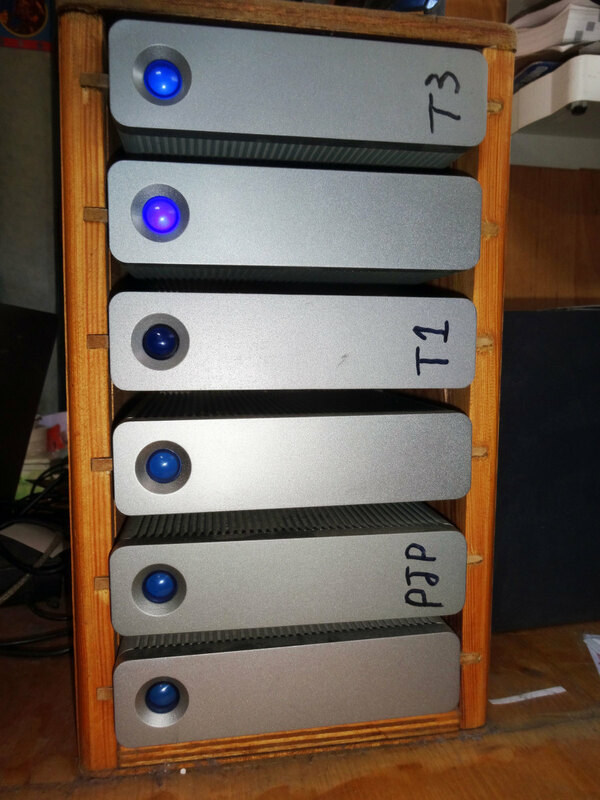 I joined at a time when records were still crossed referenced manually, but you could put your hands on a complete record history far faster than it takes to find records on a computer these days. I was fortunate in that the last five years of my career I worked in a team of Project Managers, and my line management thought it prudent for me to do the PRINCE2 course so that I could work with my team members more proficiently. 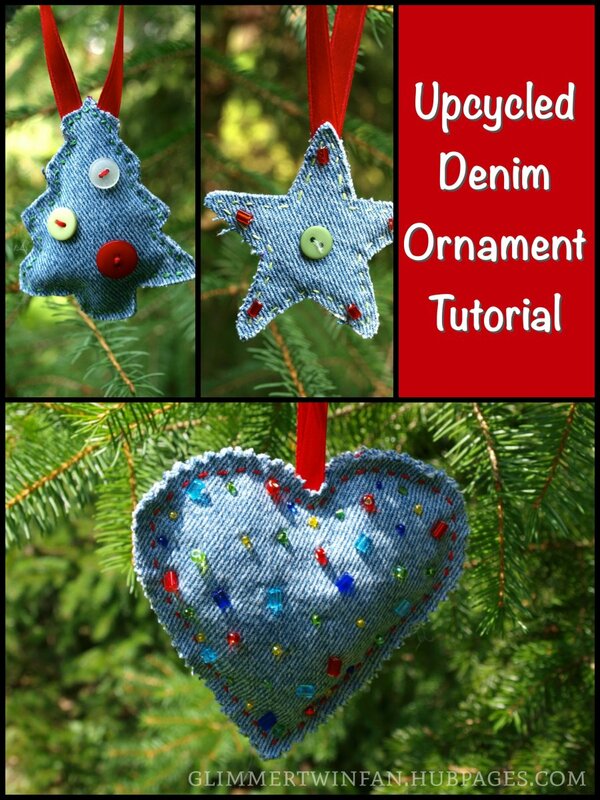 So now I can apply those skills to projects like this, and report write on them for HubPages. Thanks for your very informative and useful reply. My civil service management training many many years ago fell a little short of this! But the principles of list-making and prioritising have stuck! I could do with applying the project management criteria to many tasks, especially the home improvement projects that are hanging over me. You probably could. Although Project Management is a complex subject that takes a lot of studying to pass the exams for the qualifications; the basic principles can be adapted to anything e.g. planning and cooking an evening meal for the family, organising and taking a family holiday to Prague, or scheduling the various gardening tasks for the summer etc. Although Project Management is a management tool to help Businesses, its basic principles can be scaled down to suit even the smallest of Domestic Task. I learnt Project Management (PRINCE2) for work, but since retiring found it extremely useful for just about any task in the home. At its simplest level, a simple spreadsheet and Word Document is all you need; or even just a few basic notes on a piece of paper for a really simple task e.g. planning an evening meal. The Objective might be to cook something new for the family that you think they might enjoy. The Risks might be they don’t like it, someone is allergic to certain ingredients, you don’t have all the right ingredients, it takes too long to prepare and cook, it doesn’t turn out as you hope etc. To minimise the Risks you find out what they don’t like e.g. onions, mushrooms etc., and whether anyone is allergic to anything e.g. nuts; you check to see what ingredients you have in your kitchen cupboard and whether you need to buy anything from the supermarket; work out how long it should take you to prepare everything and the cooking time etc. The Cost is easy to calculate, the Quality is the standard you want to achieve, and the Time is how long it will take you to prepare and cook the meal. When you put all of the above together (which may only take 10 minutes to do) you begin to form a ‘Plan and a Schedule’ that can help you to deliver an evening meal for the family on Time, to Budget, and to the Quality (Standard) that you set, that hopefully the family will enjoy. Your project management cornerstones could have multiple applications. I wish I could apply them to my hub writing! Thanks Liz, I find that recycling salvaged wood, and breathing new life into unwanted furniture by upcycling, is rewarding. I also find that defining ‘smart’ objectives at the start of any project (part of my Project Management Training) helps to focus my mind on what needs to be done, and how it should to be done. Thus, better ensuring all aspects of my project are covered successfully in line with the three cornerstones of Project Management; Time, Cost and Quality. You definitely achieved your objectives with this impressive piece of workmanship. 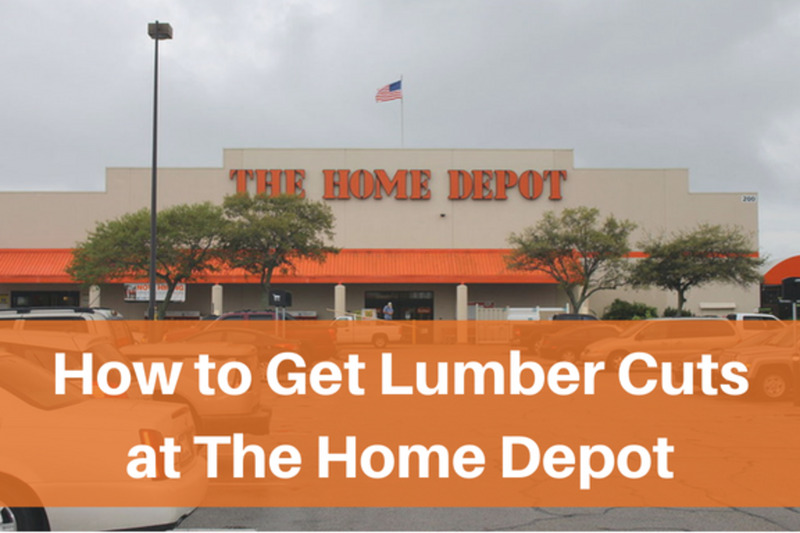 In addition you have crafted a detailed hub about the whole process.